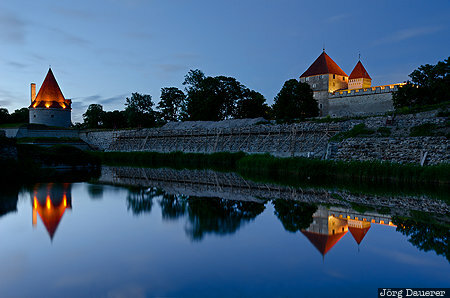 The flood-lit towers of the castle of Kuressaare (Arensburg) reflected in the calm water of the moat of the castle at the blue hour after sunset. Kuressaare is on the island Saaremaa in the Baltic Sea in the west of the Baltic state Estonia. This photo was taken in the evening of a sunny day in June of 2014. This photo was taken with a digital camera.